Last time, I shared pics from my first game of Advanced Song of Blades and Heroes at my local game club. I set up the table for the game entirely with cardstock, print-and-play terrain that cost me next to nothing to print and assemble. The main terrain features—the ruined church building and the scattered archway ruins—were designed by one of my favorite papercraft publishers, Dave Graffam models. If you’re interested in diving into cardstock terrain for your game table, this post will show you where to begin. Dave Graffam Models on Sale! Until September 1, 2018, Dave’s running a huge sale on his models at DriveThruRPG, RPGNow and Wargame Vault. Over 100 of his science fiction, fantasy, historical, and post-apocalypse models and game mats are marked down to just one or two dollars! Don’t miss this great opportunity to try Dave’s models out, or to expand your existing collection! Dave’s one of the most prolific designers in the paper model space, and he’s been publishing for many years, so he’s built up quite a catalog. Not surprisingly, his models range from very simple to fairly complex. If you’re new to papercrafting, you’ll want to start with something easy, and work your way up. That way, you’ll get some really great terrain on the table quickly, build your skills, and avoid frustration. The first thing you’re going to want to pick up is Dave’s Paper Modeling Guide. This free, 23-page PDF, written by Graffam associate Jerry Jensen, lays out the materials, tools, and techniques you’ll need to succeed at building cardstock terrain. Excellent photographs throughout the guide illustrate the processes as they are explained. Over time, you’ll develop your own methods, but the techniques illustrated here will get you pointed in the right direction. I only have one major quibble: the guide recommends using the back your hobby knife blade to score fold lines before folding, but I find that it’s difficult to avoid scarring the paper surface, or cutting clear through, with even the back of the blade. Instead, I recommend a duller tool, such as a letter opener, the point of a bone folder, or even an old butter knife, which will press a crease into the cardstock without cutting the fibers. In my own crafting, I use the edge of a tool intended for pulling staples out of bulletin boards, which is precise enough to score where I want, but not so sharp that it damages the paper. One of the most useful kinds of terrain you can have is also one of the easiest to assemble: crosspiece ruins. These modular pieces can be easily arranged to an infinite variety of configurations, so your battlefield will be different every time. In my ASoBaH game, I used Dave’s Archway Ruins Set to represent a long-forgotten cathedral. Dave has several sets of crosspiece walls and ruins, many of which have compatible slotting allowing them to be connected to make an even wider variety of ruins. The original Crosspiece Ruins Set and Crosspiece Ruins Set #2 have textures and slots that match the Archway Ruins Set. I used the Stone texture in my Advanced Song game, but the Tudor skin works well for fantasy settings as well. All the crosspiece ruins are very simple to assemble. Each section is prints out as a single piece that you fold over and glue, just like a 2D cardstock miniature. When cutting out the slots to fit the pieces together, be careful not to cut them too wide—you want the sections to grip one another for stability. The crosspiece ruins are simple to assemble, tremendously useful, and very inexpensive—just $2 a set at regular price. But when you’re ready to step up to building true 3D models, Dave offers three free sets to help you get started. I’ll look at those next, in increasing order of complexity. Hovel model shown with figures from Printable Heroes. Dave’s Hovel model couldn’t be simpler. It’s a tiny, tudor-style house made of just three parts—roof, walls, and ground. The model fits on a single page, and there are no layers to confuse things…just print the PDF as it is, and start assembling it. 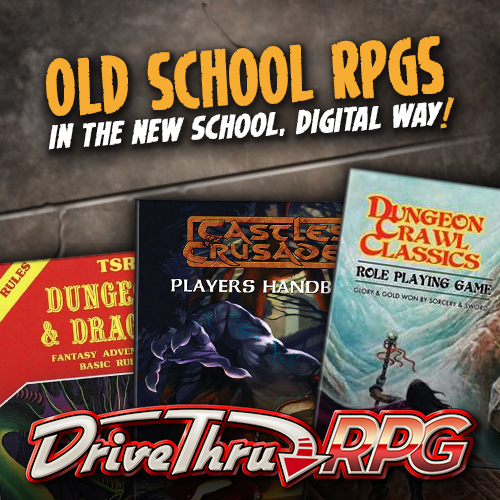 It’s listed on DriveThruRPG as a Pay-What-You-Want product, but Dave obviously intends to give it away, since the file name is “Hovel-Free-Sample.pdf”. Once you’ve got the process down, you can assemble this house in 15 minutes or less, so there’s no reason not to make a handful to scatter among the larger houses you’re almost certainly going to build later on! Free Cargo Pods shown with red shirt crewmen from Where No Man Has Gone Before, by David Okum. The Free Cargo Pod is a no-frills version of Dave’s regular Cargo Pod kit, but its still a pretty swell model that will dress up any sci-fi battlefield. The single-page PDF really introduces the amazing array of texture choices Dave offers on most of models. This kit has twelve optional layers, giving you four options for base color, three colors of stripes, two different corporate labels, three styles of weathering, and optional panel details. I haven’t done the math, but I’m sure you could make several dozen unique cargo pods with this free kit. The model is a single piece, which you trim out and score, then fold and glue into shape. I’ve built the kit several times and I’ve had the best luck by completely assembling the end caps first, then working around the sides one panel at a time. Be patient and glue the tabs one by one, and you’ll have no trouble. The full version, which costs just $3 at regular price, adds a variety of three-dimensional details to the basic pod, not to mention 90(!) texture layers to create thousands of different cargo pots. But even the free version looks so cool on the table that the most die-hard fantasy gamer will be tempted to take up Warhammer 40K or the old-school style White Star RPG. Once you’ve completed the Hovel and the Cargo Pods, you’re ready to move up to the big leagues with Dave’s Coach House. This model is free also, but it’s every bit as fully-featured and impressive as any of Dave’s paid kits. With the Coach House, you’ll have not only several texture variations to choose from, but you’ll be adding three-dimensional details like chimneys and bay windows to the mix. You’ll also have to use PDF layers to position all the windows, doors, lanterns, and weathering, so the whole process can get pretty overwhelming. Fortunately, Dave includes a single-layer version in the kit, with all the decisions made for you. I usually build the pre-fab single-layer version once, to get my bearings, before trying all the options in the multi-layered PDFs. Although this kit was conceived as a coach house, the optional layers allow you to print and build it without the big coach-house doors. Thus, you can configure it as an ordinary, for-people house or shop as well. Build it once as a coach house, and again as farmhouse without coach doors, and then you’re ready to take on any of Dave’s more advanced models! A Ruined Church serves as a hideout for Printable Heroes’ orc warband, lying in wait for warriors adapted from the Card Hunters online fantasy boardgame. The centerpiece of my all-cardstock table the other night was Dave Graffam’s Ruined Church model. Although I’d built fifteen or twenty Graffam models before attempting the ruined church, it was still the largest and most complex building I’d tried. It’s not that it was especially difficult, but with all the interior structure and detail—five floors with posts and staircases in the tower, a wrap-around balcony with rails in the main chamber, a removable panel on one side of the tower, and two-sided wall and roof panels throughout—there were a lot of steps along the way. As I recall, it took a couple of long evenings to complete, probably between six and ten hours in all. Our heroes had no way to know the tower was full of orcs! But it was definitely worth it in the end. It’s impressively large and detailed, dominating the table, and it’s surprisingly strong. Constructed out of two layers of 110 lb. cardstock laminated back to back, it’s able to support as many plastic miniatures as you can pack into it. Even if your minis are cast metal, you’re not likely to overload it. Dave Graffam Models offers literally dozens of models between the Hovel and the Ruined Church, of course, so you’ve got lots to choose from as you level up as a papercrafter. He’s also got a large and growing assortment of science fiction and post-apocalypse models as well. He released the amazing Babylon line of modular SF buildings last year, and this year he’s gone all-in on terrain for Gasland, Osprey’s hot new post-apoc vehicle combat game. But whether you’re a roleplayer or a wargamer, and no matter what genre you prefer, Dave Graffam Models has cardstock buildings and terrain that will bring your table to life! Hey, Kevin. It’s not hard to save them, but the method isn’t really obvious. When you have the file open in Adobe Reader, set the layers the way you want them, then click PRINT (not Save or Save As). At the bottom of the list of available printers will be an option to Print to PDF. Choose that, then select the pages you want to include in the file (“All”, “Current Page”, or a range of pages), and click Print. This will open a save window that will let you create a new, single-layer PDF file that looks just like you intend. You can then take that file to your preferred printing service, and have them print it out. That way, they can print the file as-is, without having to toggle any layers to get what you want. I know that some cardstock modelers do print on “normal” paper and then use spray adhesive to affix them to heavier stock, but after building lots of Dave Graffam’s and similar models, I’ve found it’s not necessary. 110lb. cardstock—which is what the models are designed for—is amazingly strong when assembled into a three-dimensional shape. On the other hand, everyone I’ve seen try to use heavier stock, up to and including foam-core board, winds up having to make difficult adjustments to the original design to compensate for the thickness. And besides, almost anything that will crush a 110lb cardstock model would have crushed one made out of chipboard or foam-core anyway. I strongly recommend everyone build at least one model using the designer’s recommended cardstock before you start tinkering. Dave’s released literally hundreds of models, as have most other publishers, and they have a pretty good idea of what they’re about.